FRANKO’S Rail Tours of VIETNAM (ABN: 82 679 818 112) is an Australian travel company specialising in Rail Tours of VIETNAM by Private Train, and tours of CAMBODIA and LAOS. FRANKO’S Rail Tours of VIETNAM is a Registered Travel Agent. License No: 32735. Based in Ocean Grove, Victoria - most of our travel clients come from all around Australia, and some from overseas (New Zealand, Europe, USA). From the very beginning we have been an internet/telephone/mail based tours & travel company providing client travel services and advice through our website, email, telephone and Australia Post. Planning, booking and preparing for a tour has never been so easy ...all accomplished without leaving the comfort of your easy chair! Our clients are kept fully informed every step of the way leading to Day 1 of their particular tour. While many tour & travel companies offer tours to these fantastic destinations, no other offers the incomparable advantage of touring Vietnam aboard a PRIVATE TRAIN. Not to be missed! *Please see "Why the Train?" "the very best way to see VIETNAM". FRANKO’S tours to CAMBODIA and LAOS are, like our Vietnam tours, focused on providing clients with a great holiday. *Please see separate Tour itineraries. Our clients can either book tours to Cambodia and/or Laos in conjunction with a Rail Tour of Vietnam, or book separately and tour these countries at any time of the year. Our tour itineraries are time proven and are designed to ensure you truly get to see these destinations from every angle. Also, clients can freely choose the level of hotel accommodation they prefer ...we offer 3, 4 and 5 Star hotels on every tour. Our Cambodia & Laos guides are the very best ...just what you deserve! Let FRANKO’S show you the experience of VIETNAM, CAMBODIA and LAOS we know so well. Veterans, holidaymakers, travel and business groups are all catered for ...as long as you like to travel by train / coach/ riverboat/ tourist ferry/ canoe/ junk/ cyclo/ elephant/ golf cart and hot air balloon! Short version: In 1991, the Vietnamese government invited a joint parliamentary party (7 members of Australian Parliament plus wives) to take a tour of Vietnam by private train. This was an offer of friendship to Australia - being one of the first world governments to recognise the new Socialist Republic of Vietnam (1976). 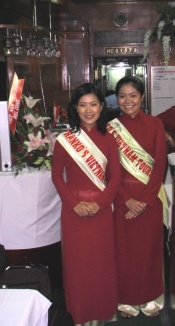 One of the ladies on that tour (Dorothy Button) was impressed enough to start her own travel company (Vietnam Ventures) and in 1992 pioneered the first of many Rail Tours to follow. 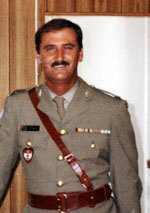 Frank O’Brien (FrankO) was an army officer on that very first tour - he spoke Vietnamese, and won the job of escorting Dorothy’s future tours. Dorothy left the tour business in the late nineties - subsequent demand, and all the right contacts in Vietnam, led Frank to follow-on, and by 2003 the tours had grown from 14 to 18 days and upgraded to 4 star hotels. FRANKO’S Rail Tours are based on more than 20 years of touring Vietnam by private train. For Club/Association committees - Frank and/or Natalie are happy to respond to any requests to provide a presentation or information session to your club members. Our formal presentation is around 40-45 minutes (including screening of DVD) then happy to respond to questions from attendees. FRANKO’S Rail Tours include the opportunity to visit LONG TAN and NUI DAT for ANZAC Day and Battle of Long Tan Day ceremonies. "your people on-the-ground are first class Frank ...the very best!" - Mac. Perth, WA. "We’ve taken many terrific tours around the world, but looking back, still agree that your Rail Tour of Vietnam in 2005 was the best of them all." - Neville E. Perth, WA. "We felt like VIPs for 18 days. Please thank all your wonderful Vietnamese staff" - Boz & Barbara. Victoria. "Absolutely fantastic tour FrankO, much more than what we expected! Faultless organisation and the most wonderful staff ...our thanks to everyone involved" - Pat & Mary. Queensland. "Thoroughly enjoyed the tour Frank ...thank you. As promised, our guide (Zen) was fantastic ...The best! I'll certainly be telling my mates about FRANKO'S" - Ken Hall. Melboune. "We had a great time Franko. Thank you. Originally we were disappointed there was no private train tour in June, but you talked us into taking your ticketed rail tour ...we are so glad you did! We've told our friends to put you on their Bucket List! Now we are saving to do the private train trip with you in 2014. Can't wait!" - Glen & Jenny B. Sydney. "...nothing will ever compare with that most wonderful of wonderful holidays that you gave us in Vietnam. We still talk about it and it has certainly set a benchmark for any future o/s trips that we do." - Roger & Judy P. Sydney. "We have travelled on many tours around the world, but this tour with FRANKO'S has been the best experience of them all!" - Dr P. J. Melbourne. took the time to send us their thoughts ...very kind!